Hey everyone! Hope you all had a lovely weekend! 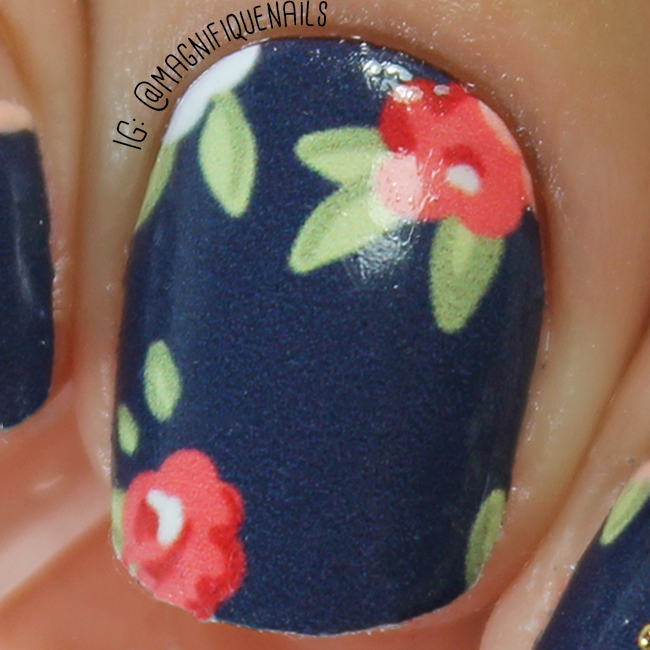 A few weeks ago I reviewed these amazing nail wraps called Appliq. Nail wraps are now becoming a very popular outlet for so many people. They are just perfect for those laid back, lazy days. However, these are not your simple nail wraps, nor are they sticker or vinyls. These are exclusively printed with real nail polish...YES! Which is why they are the next level nail wraps out there! With tons of unique designs and patterns, even collaborations with the best artist out there (and not just nail artist). The founder is by, non other than one of my top fave nail artist, Kelsey from Mani Meuse. This set is called Country designed by Appliq. 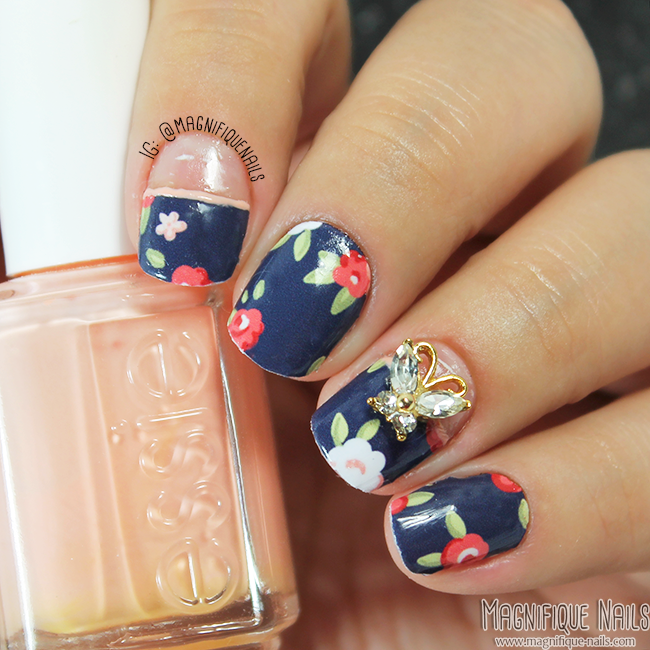 This design is super cute and girly. 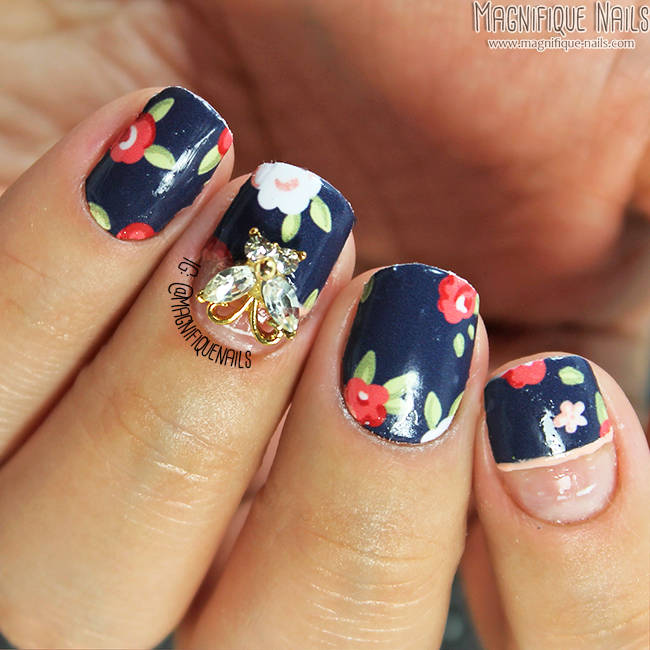 Even though they are the typical floral print, these just perfect to expand the amount of creativity. I really loved the colors, an was particularly inspired by Essie 790 A Crewed Interest. I even wanted to add a butterfly charm from Daily Charme, that looks adorable with the wraps. In the package it comes with a buffer/nail filer, a cuticle stick and of-course 16 wraps in a sealed package. Like I've mentioned on my last review, one of the technical issues I came across with nail wraps was always the top coat. As for the application, the nail wraps were very easy to apply, especially following their how to tutorial! No need for a base coat (in my opinion), but it is optional. Now for the most anxious part of the process the top coat. 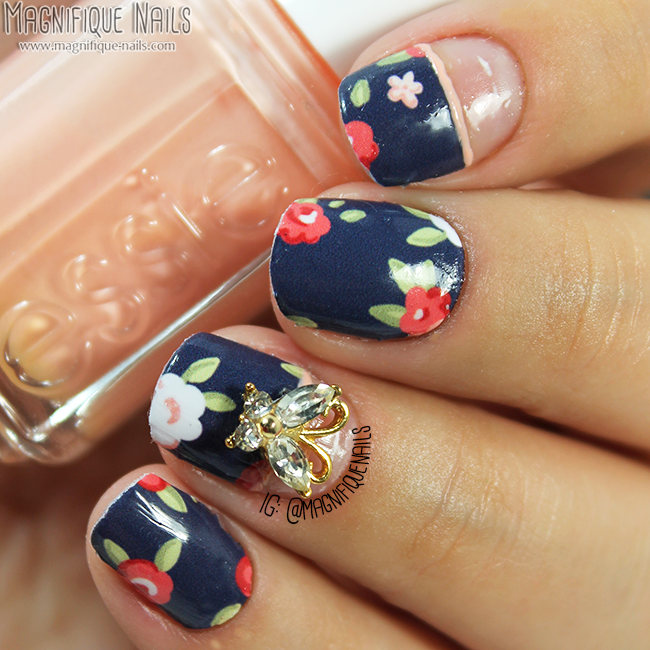 As suggest from their site, you can apply gel top coat for a long lasting wear. However, since the first wraps I tried, worked amazingly with regular top coat I used K B Shimmer Top Coat. I thought to apply them on all of the nails. Well that was a nail fail. The moment it went on there was an intense crumbling and wrinkles. I was seriously disappointed, since I really loved these wraps. I was not going to give up, so I removed and reapplied a new set. This time however, I sealed all of the wraps with ASP Soak Off Gel Polish Top Coat (which you can purchase in Sally Beauty) and cured it for 30 sec on UV/LED light. This time it looked amazing, as shown on the photos. Even better they lasted a long time, a full week! I was really happy about that! Overall I loved the results on the wraps, however, I realized it is best to test drive your top coats to see how well they react on each design. These sets had the best results with gel top coat. Now I can't wait to try the next sets to see their turnout!